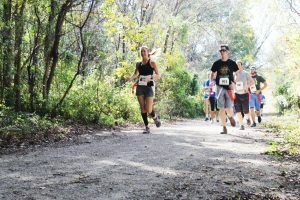 Runners of all ages and fitness levels are invited to compete in the Pittsburg Parks & Recreation Department Zombie Survival 5K. Those wishing to compete should be advised – this is no ordinary race. 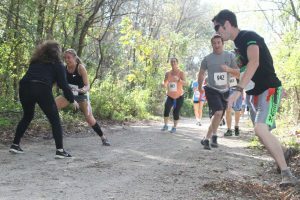 Participants’ strength, skill and endurance will be tested as they attempt to outrun the zombies and creatures wandering throughout the course. The adventure takes place Saturday, October 28, at Lincoln Park in Pittsburg. Registration starts at 9:15 am and the race begins at 11:00 am. At check-in, participants will receive a flag belt with three “life” flags on it. Zombies around the course will attempt to take the flags. If participants make it to the finish line with at least one “life” flag, they will be named a zombie survivor and will be entered for a chance to win a prize. All competitors who complete the race with or without their “life” flags will receive a unique finisher’s medal. Water and snacks will be available for participants after the run. Children 12 years old and younger can register to run, but must be accompanied by a registered participant 18 years of age or older. Cost: $20 for youth and $30 for adults. Cost for late registrations (October 23 – 28): $25 for youth and $35 for adults. Registrants can pick up their t-shirts at check-in location on the day of the race. Pittsburg Parks & Recreation Department is seeking volunteers to help with registration, serve as course guards and zombies. For more information or to volunteer, contact City of Pittsburg Recreation Superintendent Sara Vacca, at sara.vacca@pittks.org or call (620) 231-8310. • By phone: Call (620) 231-8310 to register by phone with a debit or credit card. • In person: 710 W. 9th St., Pittsburg, 8:00 am – 5:00 pm Monday – Friday. • By mail: Submit completed registration form with payment to: Pittsburg Parks & Recreation Department, P.O. Box 688, Pittsburg, KS 66762. Proceeds from the event will fund improvements to Schlanger Park, including accessibility for children and adults with disabilities. Participation in this event will support enhancements to city parks, providing all children the opportunity to thrive and grow through play.